First I want to thank you for the amazing frontend, easy to use, and fun to have one place where you can have all your old games by the hand! 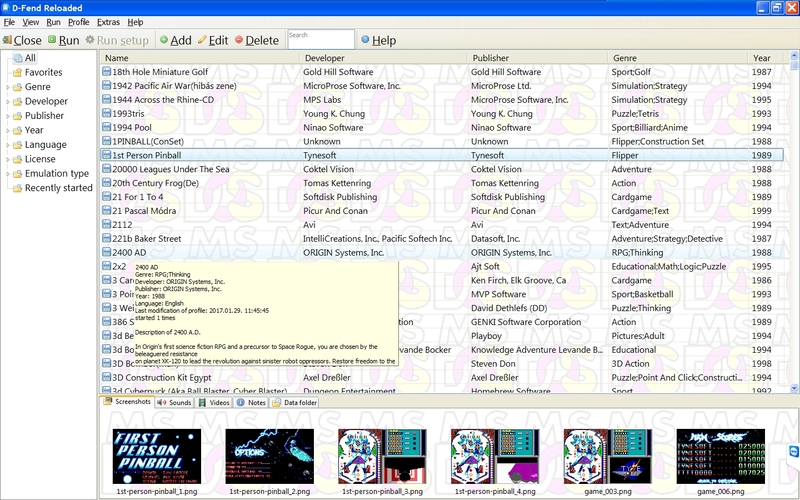 I may have a suggestion, it would be nice to have a noption to look in subfolders to import games. Other than that, since a moment I have the program crashing for weird reasons and sometimes it fails to start. I always have the same error in the event viewer, I tried to uninstall d-fend reloadend and reinstall (without keeping the folder in my home folder) and it seems to work for a moment and it crashes again. does anyone have any clues? SedrynTyros wrote: So, when you use OpenGL scaling it upscales the image using a nearest-neighbor algorithm, so you get a nice, crisp version of the original image versus what happens when an image is upscaled using a bilinear algorithm, where it ends up looking like you're viewing it through a glass of water; all blurry, hard to look at for more than a few minutes without getting a headache (so it amazes me that some people prefer it this way). The problem is that ScummVM changed the way it handles the image scaling, at least in the current SVN builds I use. It used to be that all you had to do was set "openGL_nearest" in the filters option. But now they've split the functionality into two settings. You need to set "opengl" as the filter but you also need to set "vga" under the "render_mode" setting. D-Fend Reloaded 1.4.4 currently appends the render mode setting as "render-mode" to the commandline rather than, say, adding the line "render_mode=vga" under the [scummvm] heading in the ini file. If you right-click one of your scummvm games and choose to view the config file you can see how D-Fend lays it all out, and right now it's borked; adding "render-mode=whatever" to the commandline of scummvm does squat and that's all D-Fend is able to do currently, probably because that's how it worked in older scummvm versions. As to your second question, there's a setting in D-Fend that allows you to point to where your ScummVM install is located. 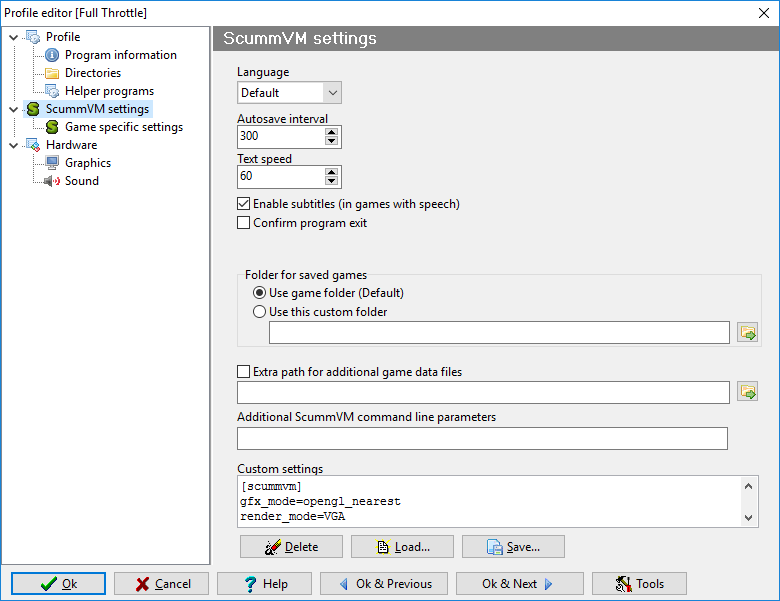 If you want you can store a folder named "ScummVM" within your D-Fend Reloaded folder and use relative paths so that it always knows to find it there. I'm using ScummVM version 1.9.0.2. I've played around with this a bit, and I think I've got it to work, at least with this build. It should work. I added updates_check=0 because every time I launched the game (after adding the other two parameters), it kept asking me about how often I wanted to update. I am not sure why it asks me in this scenario, versus when I have nothing in the Custom settings box. Though I might add, I got opengl_nearest to work without setting the render mode to VGA. I just let it stay as "default" and it seemed to work exactly the same. Is there any reason in particular why I shouldn't let render mode stay as default if it seems to work otherwise (when using opengl_nearest)? In your opinion, is it preferable to play ScummVM games with the OpenGL (no filtering) option? Is that the only mode that gives you that crisp image that you're talking about? Another question - when using opengl_nearest, is there any way to increase the size of the ScummVM window upon launch? I noticed that you can click and drag the window to make it whatever size you want, but I'd prefer to have it automatically be larger when I launch the game so I don't have to manually resize it and try to get it just right so black borders aren't showing. Yeah, I tried that already; it no workie. Adding a 2nd [scummvm] header seems to void some of the settings in the default one. It may work on the ScummVM version you're using but I've never used 1.9.0.2; it must be before the changes to render_mode that are present in the current daily builds. "opengl_nearest" isn't a valid selection any longer in the current builds. It's now just "opengl" with the nearest-neighbor scaling being moved to render mode. I want to use the current builds because they have updated Munt emulation that was added in December. So I've just been running ScummVM outside of D-Fend Reloaded. The long term fix for this is for the D-Fend Reloaded developer to change the way it handles the render_mode variable. I think there are other scaling methods that will deliver the same crisp image, like 2x or 3x scaling. I prefer OpenGL because it's more flexible than using the integer scaling methods; you can resize the window to be whatever size you want with OpenGL or go fullscreen and have the image scale to fill your monitor's viewing area. There were a few different opengl options in the older builds and I think one of them may have automatically created a larger window ... but I can't remember. opengl_nearest is the one I decided to go with and if you alt-enter to fullscreen it'll maintain the correct aspect ratio while filling your screen. If you want to see what the other filter options are you can launch the ScummVM client and look at them there. Hey - I was just thinking about this today because I was messing around with ScummVM and D-Fend reloaded. I downloaded ScummVM version 1.10.0 for the updated MUNT emulation and I'm pretty sure I got opengl working correctly (the picture is nice and crisp and not blurry). Let me know how it works. Also, as an aside, Full Throttle Remastered just released today on GOG and Steam. Hey, thanks! I'll try it out when I get the chance. Yep, it works for me. Last edited by SedrynTyros on 2017-5-17 @ 15:43, edited 1 time in total. Would it be possible to have D-Fend Reloaded show a column for the game installation path? Hi, first of all thank you for the awesome front-end, can't wait for the next update, I've been using it with the latest DOSBox ECE and it's great. Couple of questions tho: since DOSBox ECE added some new options, can I add them to ConfOpp.dat and assume that it will work? Also for the next version, would it be possible to implement a "Forced" checkmark in the graphics section next to the scalers? Sometimes scalers only work when you have a forced parameter next to time. (Example in a dosbox config file: "hq3x forced" instead of just "hq3x". I was just able to add nuked to the [SBOplEmu] section of that file (in %USERPROFILE%\D-Fend Reloaded\Settings) and it shows up as a selection under Hardware->SoundBlaster->OPL emulation. Do you know what other options ECE has added? Taiyoumaru wrote: Hi, first of all thank you for the awesome front-end, can't wait for the next update, I've been using it with the latest DOSBox ECE and it's great. in the ' category ' drop down box select the appropriate section, add the value and click Ok. Thank you for the method Dagar, I've never actually interacted with the File options before, it is indeed quicker than editing the ConfOpp.dat with a text editor. It is indeed the same as well as the options I added in show in the Default Values list. The new lines are normal4x, normal5x, normal6x and hq4x. Presumably the actual value DOSBox uses is in parenthesis while the line of text before it can be anything. Now I moved overlay below the surfaces but initially it was surface,overlay,etc. without the 3 other surface options. Doesn't look like it's not working so it's cool. For surfacepp/np/nb you will need to set scaler to NONE and be in fullscreen with aspect correction, with the fullscreen resolution set to 0x0 or desktop (same thing). You should add "desktop" to the 'resolution' category just to be sure, since this is what ant_man specified in his pixel perfect patch, although presumably you would get the same effect with 0x0 which is already present in D-Fend Reloaded. For other options I don't remember editing D-Fend for them but you can find a text file in the ECE folder that tells you what's been added. If that fails perhaps a quick ask in the ECE thread might help, depends on the options you might want. I've got a question as it relates to the "Helper Programs" function of D-Fend Reloaded. When I launch a game, I'd like to first launch a midi synthesizer (Sound Canvas VA), and then have the game be launched. I notice that DFR has a "helper programs" section, with options to "execute before the main program" and "wait before execution of the main program". However, even with both of these boxes checked, DFR seems to launch both the synthesizer that I point it to as well as the game almost simultaneously. So to that end, I tried pointing the "helper programs" field to a batch file which included a pause or sleep parameter. However, although the batch file does successfully launch the synthesizer, the pause and sleep parameters seem to be ignored, and the result is the same (the synthesizer and the game launch at roughly the same time). So what I'm asking is, how can I make DFR wait a few seconds (to ensure that the synthesizer is fully initialized) before the game launches? What's the best way to do this? Actually, I figured it out. By using a batch file and the ping command (as a method of making the batch file wait), it does pause accordingly. I may use a VBS script instead to completely hide the CMD window. Edit: The timeout parameter seems to work better for this purpose. ncng87 wrote: Using D-Fend Reloaded with DOSBox MB6, I have my DOS DesignCAD 2-D program running on my Win 7 64 bit computer. Now I need to be able to print out drawings to my wide carriage Panasonic KX-2624 dot matrix printer on LPT1. The printer driver in DesignCAD already formats the data for direct printing. I have found several posts about changing the configuration file but with the D-Fend Reloaded front end, it erases the configuration file when you close the program. Is there some way in D-Fend Reloaded to change the profile data to add/change the information for [Printer] and [Parallel] to do what I want? Did you manage to get it working? I tried to link it to the dos software but somehow it was not able to link to printer. When using the Helper Programs "Wait before execution of main program" option, I get a second "ghost window" in the task bar. After closing D-Fend Reloaded, this ghost window remains until I try to launch D-Fend Reloaded again, at which point the window closes, and then I must try to launch it once more. If I disable this option, the window does not appear. However, it is a very useful option to me. Edit: Solution found here. This will work with all DOSBox games, but not ScummVM. Trying to figure that out now. Using 4DOS's delay command will allow you to pause launching of the game while other programs initialize (which were launched from the helper programs dialog box) without creating a duplicate D-Fend Reloaded window. Just make sure to uncheck the "Wait before execution of main program" box. I have teamed up with pycur to produce a library for D-Fend Reloaded, making DOS-games as accessible as frontends like MAMEUI (arcadegames), Gamebase 64 (Commodore 64) and FS-UAE (Amiga). The goal is to build a library of preconfigurations with snapshots. To accomplish this we test all sorts of titles, examine their content, test them, determine the name of the executable and setup, find the cycles, set proper audiocards and capture snapshots if needed etc. If you are interested in helping out, drop pycur an e-mail at robotkuutya at gmail.com. Last edited by JemyM on 2017-8-21 @ 13:06, edited 1 time in total. We don't support "abandonware" here. That post was deleted since that's all it was concerned about. This thread is for D-Fend Reloaded not for promoting or supporting "abandonware". DosFreak wrote: We don't support "abandonware" here. The outcome is D-Fend profiles with snapshots to complete preconfigurations already offered by DFend (thus allowing on-the-fly detection of start/setup files). I found at least one bug in DFend when reverse-engineering the .prof files. On top of that I am indexing reoccuring issues and solutions for both D-Fend and DOSBox, and some useful indexes (like "required cycles"). I also document which titles produce config files produced by setup executeables and not. And I am documenting an index of games not present on mobygames with the intention to fill up their database later. And all of that without the need to "support abandonware". Last edited by JemyM on 2017-8-21 @ 13:03, edited 2 times in total. You say so, that abandonwaring is not supported, however dfend come to life to manage hundreds of games. Do whatever you like with D-Fend Reloaded. Just don't discuss abandonware activities here. It's not that difficult. You have the entire Internet, just not here. DosFreak wrote: Do whatever you like with D-Fend Reloaded. Just don't discuss abandonware activities here. It's not that difficult. You have the entire Internet, just not here. By the way may I find any programmer for D-fend? I just want to ask a minor feature in next version, if there will be another. I'ts that all, do count the games in the current filtered view and display it somewhere.